Around St George in far southwest Utah, the western edge of the Colorado Plateau is marked by large outcrops of red sandstone, viewable in such locations as Snow Canyon State Park, Red Cliffs Recreation Area, the Kolob Canyons section of Zion National Park, and in the southern foothills of the Pine Valley Mountains. 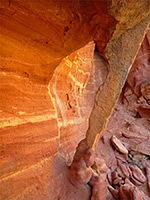 The red layer is not continuous, instead mixed with sandstone of other colors (mainly yellow and white), and much is steeply sloping, sculpted into cliffs and canyons. 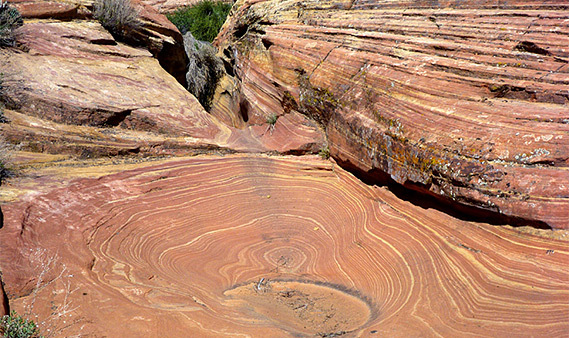 In some places the rock is characterized by thin layers, which results in pretty, wavy patterns when eroded, especially along streamways. One area that combines this aspect with a great variety of colors is Buckskin Hollow, an insignificant drainage extending just a few miles over the barren lava slopes north of St George, contained within the Red Cliffs National Conservation Area. 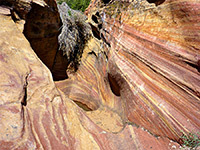 Over an area of about one square mile, the predominantly deep red rocks are combined with intense shades of yellow, pink and orange to create some of the most colorful formations anywhere in the Southwest. 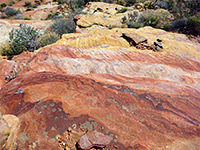 The colors occur as bands, ranging in thickness from several feet to fractions of an inch; in combination with the thin layered strata and the erosive formations created by wind and water, the location is extremely photogenic and unusual. The colors are exceptionally rich and saturated, a feature restricted to this one small area, as the nearby red rocks to the east and south are more uniform in hue, and somewhat duller. Although Buckskin Hollow is trailless and seems hitherto unknown, a maintained path does cross the upper end of the drainage, a short distance above the north edge of the colorful area. This is the Winchester Trail, one of about 40 lightly-used paths in the recently created (2009), BLM-managed Red Cliffs National Conservation Area, accessed by Cottonwood Road/Old Dump Road, an unsigned byway which begins along a nondescript back road in St George (Industrial Street), one mile from I-15 exit 8. The route is paved for a few miles, climbing fairly gently and soon exiting the built-up area, crossing arid, volcanic slopes covered only by short grass and grey lava blocks. It passes one trailhead (T Bone) soon after which the pavement ends, replaced by bumpy gravel with protruding lava and lots of loose stones. The road proceeds to a second developed trailhead, for the Yellow Knolls area to the east; the Winchester Trail also starts near here, 250 feet back down the road, on the far side. Beyond, the road surface deteriorates further, and 4WD is recommended for onwards travel, though all vehicles should be able to get this far. The road continues another 28 miles, rejoining I-15 at the small town of Leeds, passing close to other interesting areas along the southern slopes of the Pine Valley Mountains including the cliffs of Yant Flat and several short slot canyons such as Yankee Doodle Hollow. The Winchester Trail follows an old vehicle track due west, beginning at a gate alongside the Red Rock Parkway. It crosses a plateau to the rim of a wide ravine (Twist Hollow), then descends 200 feet to the streambed, following the course of some powerlines. The sloping valley sides are formed of overgrown lava blocks, and the drainage narrows upstream, where it is followed by another path (the Black Gulch Trail), though the surroundings do not seem particularly interesting. The main route climbs up the far side, passing a good selection of Mojave Desert plants including mammillaria, echinocereus and yucca. Bighorn sheep seem relatively common in this location. An area of white slickrock comes into view to the south, as the path crosses a little gully, ascends some more and meets the upper end of Buckskin Hollow, shortly after the rocks in the distance change to red. The remainder of the path continues northwest another half mile to the NCA boundary, which has private land on the far side. The shallow streamway of Buckskin Hollow is easy to follow downstream, over several small dryfalls and potholes, with just one steeper section after about two thirds of a mile that needs more care to descend; below here the drainage opens out a lot, becoming a stony wash between sloping, 100 foot cliffs, which recede completely in another mile or so. 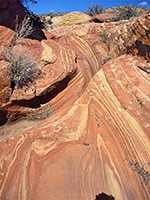 The best stripy patterns occur in the chutes, falls and cavities along the upper section of the streamway; the eroded features get bigger and more colorful further downstream, but the variegated rocks extend several hundred feet either side of the streambed so there is much to explore, even though away from the drainage the surfaces are more weathered, partly overgrown and the formations are not as crisp or as richly colored as those along the creek bed. 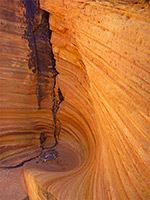 The final, sloping dryfall is about 50 feet high, just below which are a series of wind-eroded cavities, on the west side, crossed by many thin bands of bright red and yellow. Downstream, the bedrock is more uniformly red and remains so to the south edge of the sandstone outcrop. 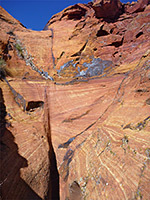 A side ravine to the east also has nice multicolored eroded structures, before the sandstone changes to white and slopes down to another dry wash; east of here, the rocks are replaced by sandy flats.